While I'm fairly certain the medications are working and Ethan's well on his way to recovery, this latest bout of sickness had stirred up Ethan's breathing issues and we've found ourselves again slave to the nebulizer every few hours. These days, Ethan is so used to the process that so long as I put on his favorite music videos on YouTube, he barely notices he's receiving a treatment. The frustration is all mine, trying to plan nebulizer treatments around mealtimes and naptime and the walks in the park for fresh air we've been taking just to get out of this house a little bit. Oh, getting out of this house a little bit. It's been mandatory, for the sake of both of our sanity. This morning was just all-around rough. I had made Ethan a smoothie from fresh, organic fruits and he took one look at it, pointing to the blended bits of blueberry floating throughout the smoothie, and declared "dirt. No more dirt." Maybe it was that he saw my exasperation over trying to point out that the blue-black flecks were simply blueberries and why oh why would I ever feed him dirt -- but he ran with the dirt card all morning. He pointed to a cat hair sitting idly on his jeans. "Dirt. No more dirt." He grabbed a spinach leaf from his soup. "Dirt. No more dirt." We drove all the way to Jamba Juice for a smoothie that I didn't make and as I'm ordering, he instructs the employee that there should be "no dirt" in his smoothie. I'd watch as he stared at me each time, a little fleck of a smile struggling to stay straight and serious. And then cue a meltdown, because he would inevitably find "dirt" in whatever he'd hoped would occupy his attention in that moment. This afternoon we headed straight for the skate park. Ethan picked his helmet up off the table, told me he wanted to wear his shark shoes and off we went in search of fresh air and mental clarity. Ethan rode his bike for over an hour, nonchalantly attempting to show off his wheels and hip new helmet to the teenage boys skating on the ramps behind him. This afternoon I asked him if he wanted to skate with the big boys one day to which he replied, matter-of-factually, "Ethan big boy. 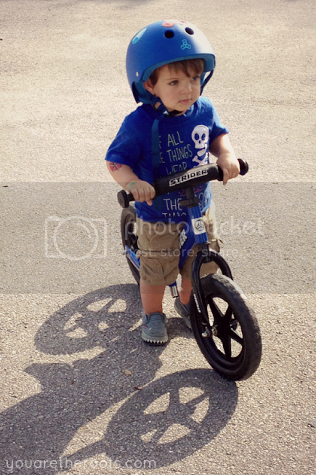 Ethan ride bike." How scarily right he was. He was a big boy, somehow before my eyes, somehow when I blinked too long and hard, somehow I woke up and he was a big boy parading his bike in front of the skaters he's come to idolize over the past few months. There is a little snack counter at the skate park where the skaters will buy water and Gatorade and choose chips or cookies and likely all the other food they aren't allowed to have at home. Ethan has watched the skaters ride up to the counter and ride back clutching their bottle of Gatorade or their bag of cookies for the longest time. "Snack. Ethan snack?" I couldn't say no to those big blue eyes, finally starting to clear up after such a miserable few days. It made Ethan's day to stand at that counter and walk back with a package of Oreos. "Ethan big boy. Big boy. 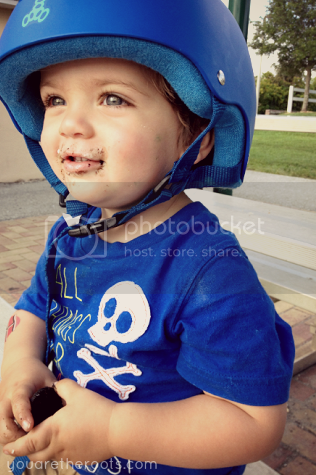 Ethan snack, skate park!" 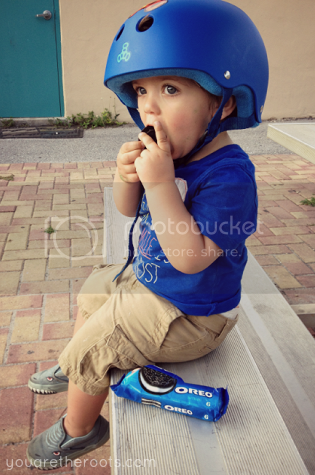 He giggled back to the bleachers where he sat licking the cream out of his first Oreos, somehow knowing of their goodness before the package was even opened. It was like the day was renewed with that first taste of cookie or with the first blow of a calm and peaceful breeze that this day was just so very much lacking. Tonight at bedtime, I let Ethan climb up into the glider with me where we rocked and sang six songs before he fell asleep peacefully in my arms. He was a big boy, all thirty-five pounds of him taking up all of the room on my lap, all of the room in my arms. Where I once sat in that same glider and rocked a newborn baby to sleep, now I held my child -- my big boy, as he loves to remind me -- who is just a couple of weeks shy of turning two. Two. I'm in disbelief, but the kind of disbelief that hurts and stings at your heart if you try to rationalize it too long or too much. I can't recall a time when he wasn't a part of me but, you know, I also don't think there will ever be a time when he won't be my baby -- no matter how he likes to correct me when I call him this. "Ethan big boy." 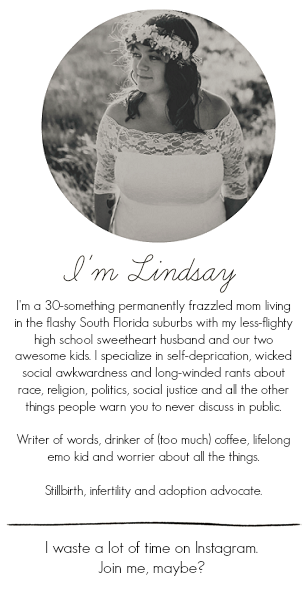 "But you'll always be mommy's baby." wow, he can ride that bike at such a young age? I have yet to try a balance bike with any of my kids. I wonder if I should get one for Simon. Neither of my bigger kids an ride their normal bikes! 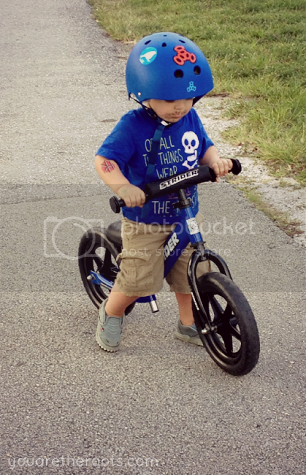 The Strider balance bike is actually really cool, it's for kids 18 months and up! Ethan loves it. He hasn't mastered the balance aspect of it yet, but loves walking it along and is getting better and better at it each time we go ride! 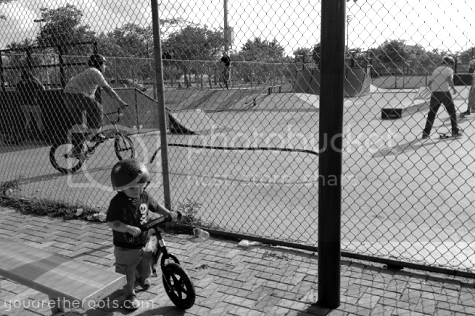 There's a little boy Ethan's age at the skate park who can actually do the skate ramps on his! Ethan loves to watch him ride.